Building organically out of the collective improvisational consciousness of the three musicians here, this live album has a very natural flow to it, moving between jagged freebop rooted in the great music of Eric Dolphy and a selection of lonely and moody ballads that develop like abstract art. 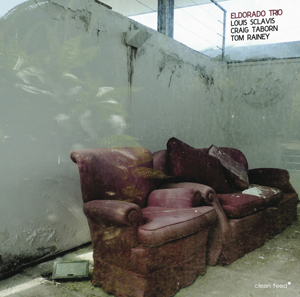 The collective trio consists of Louis Sclavis on bass clarinet and soprano saxophone, Craig Taborn on piano and Tom Rainey on drums. “Let It Drop” opens the album with a choppy melody featuring rippling fast piano and drums. Sclavis comes in with fast exciting bass clarinet, building to a high intensity peak. I heard the Dolphy influence come through especially strong on “Up Down Up” which develops a vertical improvisation, making way for a cool section where the bass clarinet bubbles underneath piano and drums. The group gets really jazzy on the bopping head-nodding “Possibilities” which is fresh and lively and very accessible. Some of the slower performances are very evocative as well. Dedicated to the late saxophonist, “Steve Lacy” has a slow and mysterious feel, sounding elegiac and melancholy. Sclavis uses honks and squeals to accentuate the swirling saxophone that was Lacy’s stock and trade. Sadness and loneliness are the emotions that inhabit “La Viste” beginning with spare and open piano and then building to an emotional clarinet solo. The music is stark and naked in its emotional resonance. The disc ends on a somber yet stoic note with “Eldorado,” an improvisation that uses slow hollow clarinet and light brushes to probe an emotional soundscape. This was a consistently interesting album, that show three talented musicians working together as one unit. There are spaces for solo expression in this album, but the most effective and impressive statements came from the group playing as a cohesive unit, making collective performances that were very impressive.